It’s here, only a few weeks of waiting too! iCEnhancer 1.2.5 for Grand Theft Auto IV on the PC! Download now! – Download link from GTA mods grabs you a link to mediafire, not sure if the 102mb+download is too much bandwidth use for the servers there or not. Either way don’t panic when you see the text file. Okay with that said, you can also check out the Youtube clips below from the finished 1.2.5 for a glimpse of what you’re getting into. keep in mind that you really do need some higher end hardware with a lot of video memory. I was running it on a 4850 and it looked great but I was handicapped by my lack of VRAM available. For those wondering, this isn’t the final version of the mod, iCEnhancer has pictures listed on a facebook page to show off a secret WIP build going on. 🙂 The header image is taken from that album. 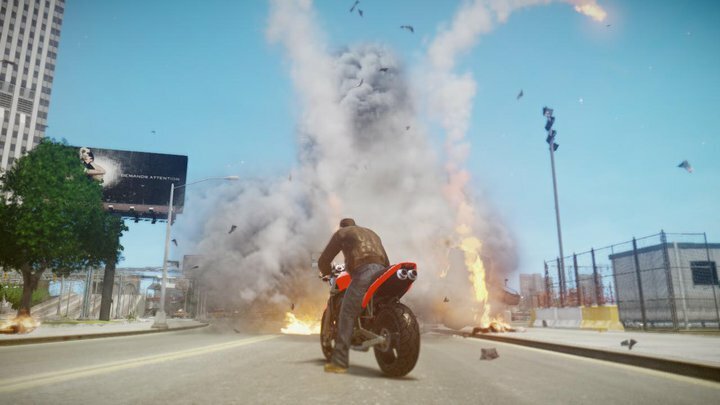 Posted on July 15, 2011 Author Gabriel VegaCategories GamesTags 1.2.5, Auto, ENB, Grand, Graphic, gta, HDR, icenhancer, iv, mod, Theft, tweakLeave a comment on iCEnhancer 1.2.5 is available! Just when you thought the arcade shooter was dead. Sega comes in with one of the campiest games ever. 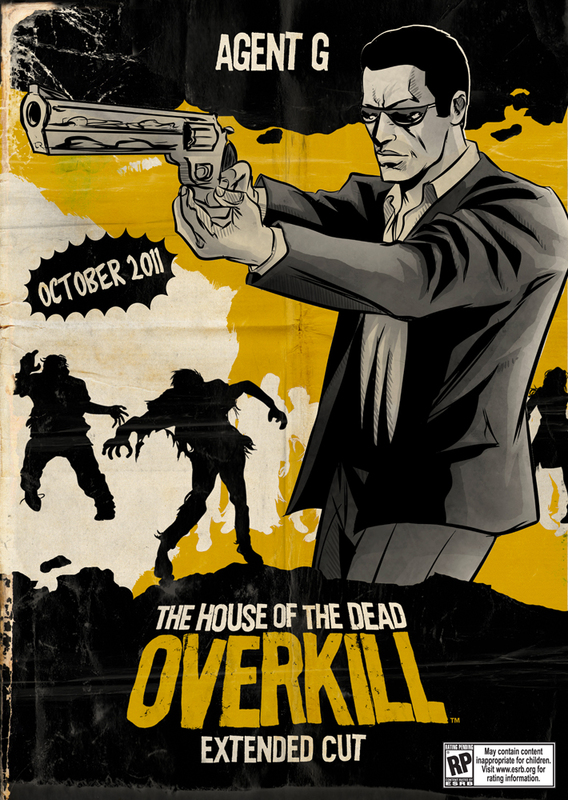 House of the Dead: Overkill is a journey into madness using the PS3 move control system this round, players will go round after round into a 70’s Grind House inspired slaughter with only their sanity to lose. Personally, Overkill on the Wii felt short, I hope they can get a little extra life out of this port because the game is funny to go through with a friend or in a group. Check out the screens below to see the art goodies and caps from Overkill. SDCC ’11 | DARK HORSE COMICS SWAG! When you make your way to the Dark Horse Comics booth at San Diego Comic-Con, expect nothing but the best in treatment and appreciation from the comic publisher with the most! — And tons of free comics and more! There’s even an exclusive Goon temporary tattoo with any purchase from the Dark Horse store on site at San Diego Comic-Con. Friday, July 22, at 4 p.m., we’ll have an exclusive ticket giveaway to the screening of Gantz 2 in collaboration with New People. Make sure you stop by! See you at the booth. Try and collect all the SWAG! It’s here! 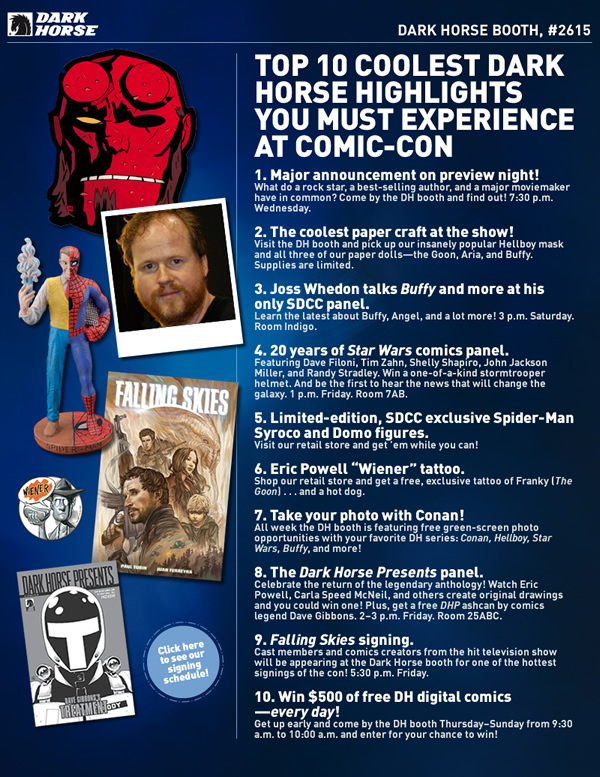 San Diego Comic-Con 2011 is upon us, and Dark Horse Comics is telling you all the goods ahead of time! Plan accordingly! Posted on July 15, 2011 Author Anthony DavisCategories Comics, NewsTags comic con 2011, Dark Horse Comics, SDCC ’11Leave a comment on SDCC ’11 | DARK HORSE COMICS SWAG!